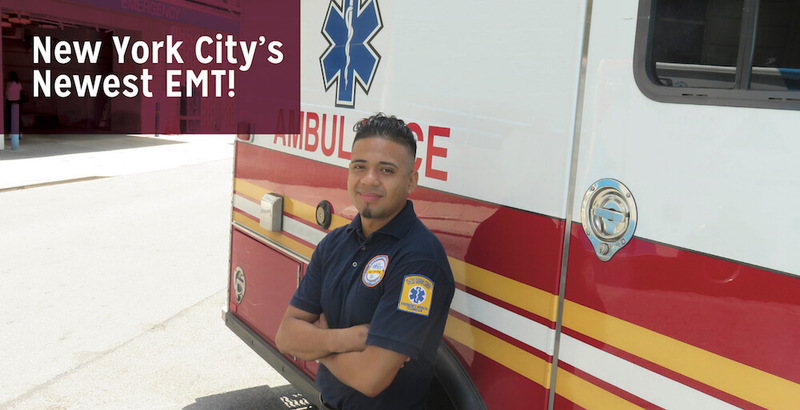 New York City’s Newest EMT – Comprehensive Development, Inc.
Omar spent the first half of 2018 in rigorous training. “The ambulance rotations were intense!” At the same time he was balancing work and raising his son, now five. “Having the individualized support of both his counselors and instructors was hugely important,” Sandra Morales, Director at the CDI Career Academy said. “Our counselors helped him manage his life issues, and the BMCC and Northwell teachers were male leaders who motivated and mentored him.” Frank Nuqui, one of Omar’s EMT instructors at BMCC, was at the testing center on the day of Omar’s state exam and didn’t leave until every member of the cohort finished.